Preorders will begin September 8th for SCORE! 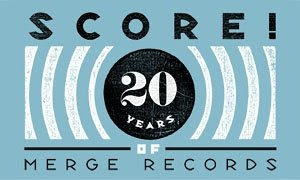 Merge Records presents: The First 20 Years, a deluxe subscription-only box set with special artwork and packaging. Quantities will be limited to the number of subscribers who enroll between the September 8th start date and the end of 2008.The first two volumes will kick off a series of 14 custom-curated compilations spanning our catalog, each featuring the curators' handpicked Merge selections as well as original artwork. These compilations and additional content will be delivered only to SCORE! subscribers throughout Merge's 20th anniversary year of 2009.The curators of the first volumes will be Peter Buck of R.E.M. and Phil Morrison, director of Junebug, The Upright Citizens Brigade and numerous music videos. Curators for future volumes will include Amy Poehler, David Byrne, author Jonathan Lethem, artist Marcel Dzama, Momofuku chef David Chang and many more to be announced.Additionally, the entire SCORE! project will benefit specific charitable causes handpicked by the curators. Wow. Kat, Paul and I went to the 5 year party at the Cat's Cradle. I am so not a youngster. I just want to know which curators pick Breadwinner and Polvo.